These Fishermen Woke Up A Sleeping Anaconda – And Eventually Regretted It! - 2NGAW! 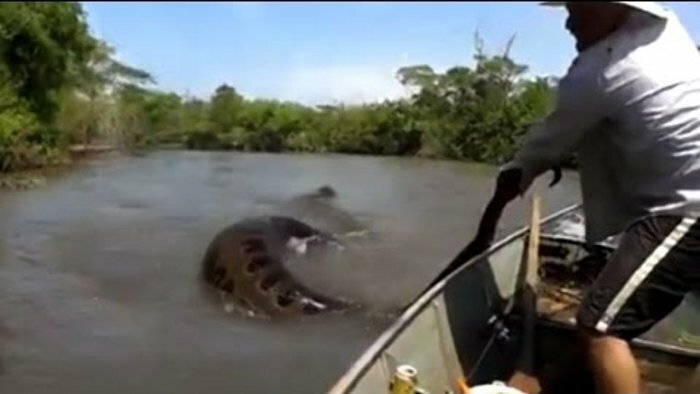 These Fishermen Woke Up A Sleeping Anaconda – And Eventually Regretted It! What will you do when you see an anaconda soundly asleep? If you are like most people, you would likely run and go your own way, grateful that the serpent will not be able to harm you at all. The video below shows us a group of fisherman who, for some stupid reason, did not follow what common sense dictated. Instead of getting out of the anaconda’s way, they felt the need to disturb the sleeping serpent. Not only that, they even had the nerve to film it all as it happened. This incident took place on the Santa Maria River in Brazil. EliteReaders shared about this story and it’s really a head-scratcher. You would wonder why they would really bother a sleeping anaconda. One of them started poking it with an oar until the upset serpent just tried to escape from the scene. Still, these guys were persistently foolish. The anaconda was already trying to swim away from them but another guy grabbed its tail. The yellow-colored Brazilian anaconda is actually known in the country as “sucuri” and usually measures about 17 feet in length. Like most serpents, it is dangerous and lethal. Fortunately for them, they eventually came to their senses and let the serpent go. They were, however, unable to escape the consequences of their actions. They were charged with a huge penalty by the authorities worth $600. Hopefully, the expensive fine will make them think twice about pulling a stunt like that next time around. They could have been the anaconda’s meal for the day if he wasn’t full. Do you think these fishermen got what they deserved? Go share this post on social media and leave a comment below. We’d love to hear what you think about this story.